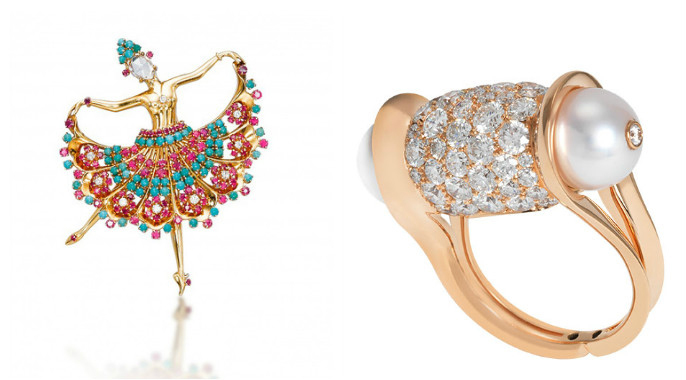 (Left) Ballerina brooch by John Rubel, with inverted rose-cut diamond face, rubies, diamonds and cabochon turquoises, and mounted in gold. The legacy of John Rubel began 100 years ago when two brothers, Jean and Robert Rubel arrived from Budapest to open their first atelier a few doors from the Place Vendome, Paris. Skilled jewelers, their talents were quickly recognized and in demand by luxury retailers such as Van Cleef & Arpels and Boucheron. The brothers were legendary as their famous “Roses” bracelet made for Van Cleef & Arpels displayed at the Exposition of Modern and Decorative Arts in Paris won a Grand Prize in 1924. In 1939, the Rubel brothers followed Van Cleef & Arpels to America where they were trusted to manufacture their jewelry. 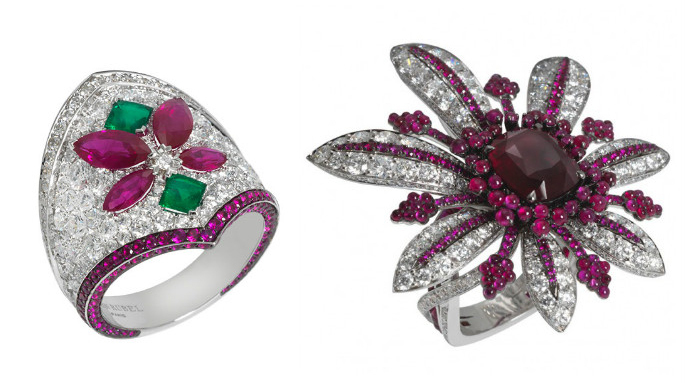 America gave the Rubel brothers plenty of inspiration when it came to jewelry design. At a nightclub on the Lower East Side ElChico one evening, John scribbled on the corner of the tablecloth a silhouette of a flamenco dancer. This was the beginning of a series of dancing ballerinas, which included the famous Spanish dancer brooch adopted by Van Cleef & Aprels. Their jewelry was of unique avant-garde style and in 1942 opened their first John Rubel shop at 777 Fifth Avenue Manhattan and also had exclusive boutiques within Saks Fifth Avenue in New York and Palm Springs. Sadly, the brand disappeared in the mid 1940’s due to the conflict of WWII. Now celebrating the centenary of the legendary brothers, the John Rubel brand was re-launched in Paris on September 8th and held its first international showcase in Vancouver a few days afterwards. 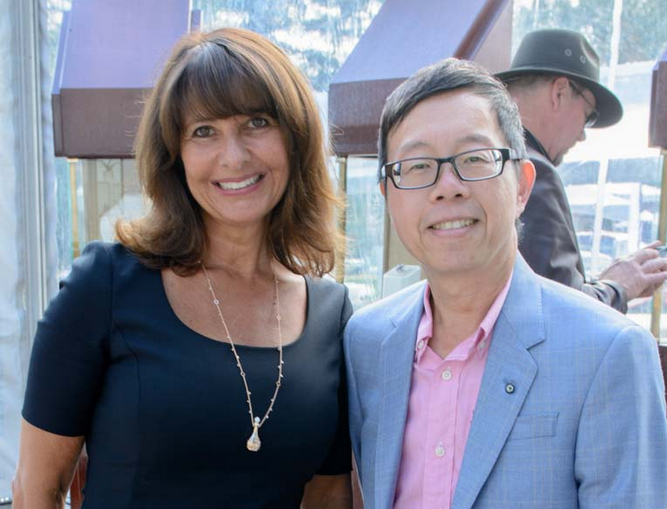 “It’s a sleeping beauty,” stated Sophie Mizrahi-Rubel, President of John Rubel at The Vault in the Garden chalet during the Luxury & Supercar Weekend. Her decision to re-launch her great-great-uncles Jean and Robert Rubel brand came about three years ago when she discovered an old wooden chest in their family’s home in Paris. Inside the chest was a long forgotten treasure, containing dozens of John Rubel’s original drawings including bracelets, rings, brooches, and necklaces from the 1920’s. Among the documents were the original patents and scale models, signed by both brothers. Sophie Mizrahi-Rubel herself is a skilled jewelry artisan who has always been in the service of prestige brands such as Cartier and Chaumet. After spending time with these newly discovered drawings, she decided it was time to carry on her family heritage and bring back to life the John Rubel brand. I was fortunate to view the totally new collection, inspired by the memories of her great-great uncles Jean and Robert Rubel. Their jewelry is quite unique as it is all about boldness and color. There is a festive spirit from Jean Rubel that lives on in this new collection. Sophie Mizrahi-Rubel will take up to one and one-half years designing a piece and another six months to craft it. All are original designs, never to be duplicated. Equally remarkable is that John Ruble is one of the few jewelry brands that is independent, not part of a luxury multinational group. A rich pedigree of extraordinary history and old world craftsmanship contributes to a mystique that can be priceless. John Rubel has returned and we’re all better for it.